Hudson Falls Central School District utilizes its teacher leadership structure and instructional coaching support to rollout the Next Generation Standards for English and Mathematics. The Hudson Falls Central School District (HFCSD) encompasses the Village of Hudson Falls and outlying communities of seven other nearby towns. It serves the educational needs of 2,366 students PK-12. The district maintains five buildings: Margaret Murphy Kindergarten Center for prekindergarten and kindergarten (MMKC), Hudson Falls Primary School (HFPS) for grades1-3, Hudson Falls Intermediate School (HFIS) for grades 4-5, Hudson Falls Middle School (HFMS) for grades 6-8, and Hudson Falls High School (HFHS) for grades 9-12. Students are 50% male and 50% female, comprised of 1% Black students, 4% Hispanic or Latino, 1% Asian, 89% White, and 5% Multiracial. Among our student population, 1% are English Language Learners, 19% are Students with Disabilities, and 58% are Economically Disadvantaged. Raising Awareness: ​​During this phase of implementation, our district has worked to identify a team of experts that will work together to educate the district and broader community of the timeline for the rollout of the Next Generation Standards. Through this learning, staff and community members will review introductory documents, and consider implications and needs to ensure success for all learners. ELA:​​ The research based curriculum that our district has adopted ( RW and WW ) K-8 is aligned to the standards and supports best instructional practices in all classrooms. Through the transition to school-wide use of the workshop structure, instructional practices aligned to the new standards are the focus of curriculum planning within departments at the high school (9-12). MATH​​: Through an internal review led by our Elementary Math Instructional Coordinator, our math program was evaluated for alignment to the standards, with the Next Generation Learning Standards considered. Standard, practice, and instructional gaps were identified, and recommended suggestions presented across all grade levels to support student learning. Each grade level for grades K-5 utilizes a companion guide to support the teaching and learning of the math standards within each topic. The following link provides a sample companion guide for 4th grade: ​4th Grade Topic 5. ...staff and community members will review introductory documents, and consider implications and needs to ensure success for all learners. Professional development sessions are taking place at all buildings throughout the year to showcase the crosswalks, learning progressions, and introductory materials to the standards. ELA: Our professional development opportunities have highlighted the ideas surrounding literacy and fostering lifelong readers and learners throughout the district. Through district PD, teachers have completed an instructional inventory using the Practices of Lifelong Readers and Writers as an entry point to discuss how instruction can support these lifelong skills. This PD includes before school, after school, grade level meeting, and faculty meeting opportunities for learning and exposure. Math: Staff members have participated in professional development sessions to review introductory documents, including the Introduction to the Next Generation Learning Standards, the Preface to the Standards, Professional Toolkit resources, and grade-level Snapshots. These opportunities have allowed staff members to identify the rationale for standards revision, the review process, and major standards changes, all while considering future instructional implications. In addition, a review of the Standards of Mathematical Practice are leading to discussions of the components of a balanced curriculum that will lead students to the knowledge, skills, and understandings required of the Standards. Our Instructional Coaching model is the conduit for professional learning around the Next Generation Standards. Our coaches work with teachers and teacher leaders PK-12 and across content areas to develop professional learning opportunities around the Next Generation Standards. They work within the grade-level teams in elementary school buildings, teaming structure at the middle school, and curriculum departments at the highs school to deliver targeted information, guidance, coaching, and instructional support for the standards rollout. They also use faculty meetings as a platform to share and inform teachers in the district about the roll out process and timeline. Outcomes: We have had successful outcomes of raising the district’s awareness during this phase of implementation. The faculty and staff throughout the district have given our administration and instructional coaching staff positive feedback regarding the information and resources that have been shared with them regarding the NYS Next Generation Standards. Our next steps will include gathering information that will identify the appropriate level and content for continued professional develop to support curriculum and instruction. As a collective, we meet monthly to coordinate and articulate our efforts around district targets and standards implementation. An example of the work tackled at one of our recent meetings can be found in our District Learning Team Presentation.​We are aware that in order for our teachers and groups to feel efficacious, they need both time to do the work and to see good models. Curriculum implementation is not a top down initiative in our district. Instead, it is implemented from the ground up. Curriculum implementation is not a top down initiative in our district. Instead, it is implemented from the ground up. 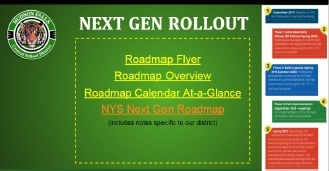 We have used the NYSED released roadmaps created to guide implementation around the Next Gen Standards. Each of our buildings has a specific plan that is completed for Phase 1. This plan is reviewed and monitored by the teacher leaders and administrators in a building. It is a live document that helps guide decisions in our work moving forward. All members of the school community have access to this document through a google site that we have created and share internally among faculty. We will continue to add to these maps as we thoughtfully move forward with implementation. Our district is an active member of the Curriculum and Assessment Council coordinated by our BOCES. We utilize supports from the School Improvement Office to provide professional development in many areas connected to the standards roll out. This relationship serves as a critical sounding board, an on-going thought partner and a provider of successes from across our region. We use the following slide to anchor every presentation around the standards. Links are embedded within the image. All staff have access to these materials.